Virtual racing can teach you how to race just as well as in the real-world. Video games and simulators are getting pretty realistic — a video game pro beat a former Formula 1 driver in a race this weekend, without decades of real-world racing experience. In a shocking victory that left commentators speechless, 23-year-old Enzo Bonito beat Lucas di Grassi, a Formula E and ex-Formula 1 driver on a winding race track in Mexico on Jan. 19. Why does it matter? Because Bonito cut his teeth in esports, the nascent world of competitors who play video games for prizes. Esports are becoming so popular that prizes recently topped out at $100 million for a Fortnite tournament last year. 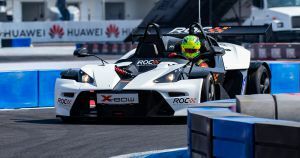 The Race of Champions, which took place in Mexico this year, has been pitting the best drivers from all kinds of motorsport disciplines against each other since 1988. Starting in 2018, the competition allowed virtual racers to enter as well. Unlike first-person shooters or real-time strategy games, “sim racing” or “virtual motorsports” simulate car racing down to details like tire wear, exact suspension design, and handling of real-world racing cars. And forget mouse and keyboard: sim racing pros use physical steering wheels and pedals, just like their real-world race car counterparts. Real-world racers usually go through decades of training, working their way up through different championships. Now simulators have become so good at what they do that they’re able to turn an esports pro gamer into a real-life champion, like Bonito. In other words, the skills sim racers pick up are actually transferable to racing inside real-world cars. While the win came as a shock, it was a long time coming. Sim racing has made major strides in recent years — the first professional esports race team launched in 2016, and is part of a much bigger network of a number of racing leagues and competitions today. The phenomenon works in the other direction as well: many real-world racing professionals are now competing in online racing platforms. But nobody expected an esports pro to get this far. In fact, Bonito went on to beat three-time Indy 500 — that’s one of the most prestigious motorsport events in the world — winner Ryan Hunter-Reay the next day.